It seems simple enough, right … poaching an egg? Over the years I seem to have done okay poaching eggs at home. I enjoy to make them to top onto sauteed greens or to place on my morning toast. My method has been to bring some water to a boil, drop in the eggs, one a time from a small ramekin, and then allow them to cook in the water for a couple minutes before removing them with a slotted spoon. After taking part in my first Craftsy class, 20 Essential Cooking Techniques, I’ve finally learned from a professional chef how to poach eggs the right way. Let me first start by saying that I’m really enjoying my Craftsy classes. They are put together very well and each lesson is in a manageable amount of time that makes it simple to fit into your schedule. I love that. Also, what I’ve been enjoying about this class is that the chef/teacher is interactive. You can ask him questions and he’ll answer you back. You can see what I mean by looking at the image below. How cool is that? It’s truly like taking a class in real life as you can communicate with your teacher. I’m excited to register for some other online classes (including a painting class I’m going to be taking with my boys) as they never expire and you can watch them over and over again. Let’s get back to poached eggs, shall we? To poach an egg, bring a medium sized, heavy bottomed saucepan of water to a boil. Once the water has come to a boil, you’ll want to add a couple finger pinches of salt and about a teaspoon of apple cider vinegar. The salt and vinegar will help coagulate the white of the egg, so in other words, it will help the white bind together more quickly. This is the fun part: with a large slotted spoon, give the water a nice swirl and carefully drop in your egg. If you have more eggs, crack them individually into the ramekin, and add them to the spinning water. This technique will prevent the eggs from immediately dropping to the bottom of the sauce pan and sticking. At this point, make sure the water is not boiling rapidly, instead it should just be simmering; adjust if needed. Once in the water, poach the eggs for 2 minutes or until the egg whites are cooked through. If you’d like more detailed information on how to poach an egg, I’d really like to encourage you to check out the online class by Craftsy, 20 Essential Cooking Techniques taught by Brendan McDermott. Brendan McDermott is an executive chef at acclaimed restaurants and is a highly sought-after instructor and teaches culinary classes at Kendall College in Chicago. He’s a great teacher and makes each lesson simple to understand. This class won’t just show you how to poach an egg but also how to enhance flavors by toasting or “blooming” spices, clarifying butter, and how to infuse cooking oils. The class also includes how to work with chicken, pork, fish, and shellfish and how to make stock. It goes into a variety of simple techniques that once you understand will help you move away from recipes. Also, don’t forget once you sign up for this online class, it’s yours forever! You can watch it over and over again. Right now, if you sign up for the20 Essential Cooking Techniques, you can register for 50% off! Now, let’s get to that seasonal tartine recipe! In this season of cooler days, I really enjoy the flavors of autumnal squashes and sweet potatoes. This is a simple, humble dish that uses the seasons finest vegetables including brussels sprouts, deep green kale, and the sweet potato. Both savory and gently sweetened (by the sweet potato and chevre goat cheese), this farmstead meal is one you’ll enjoy. An Autumnal Tartine Served with Garlic Kale and Topped with a Poached Egg: a simple, humble dish that uses the seasons finest vegetables including brussels sprouts, deep green kale, and sweet potato. In a skillet or cast iron pan, gently bring 1/4 cup of extra virgin olive oil to heat. Add the sweet potatos, and garlic. Saute for 6-8 minutes or until the sweet potatoes are crisp tender. Add the brussels sprouts and salt; saute for an additional 3-4 minutes. Remove from pan and set aside on a plate. Place the plate in the 170F oven to keep warm. In the same pan that you used to saute the sweet potatoes and Brussels sprouts, gently heat an additional 3 tbls of extra virgin olive oil. Add the kale and toss to coat. (make sure to step back a bit as the oil may splatter). Add 1/4 cup chicken broth, or water, and the salt; saute for 3-4 minutes or until the kale just begins to wilt. Add the juice of 1/2 a lemon and again toss through. Remove from heat and set aside in the warmed oven. Bring a heavy bottomed saucepan filled with water to a boil. Add 2 finger pinches of salt and 1 tsp of apple cider vinegar; mix through. With a large slotted spoon swirl the water in the saucepan. Poach the egg in the water for about 2 minutes or until the white has cooked through. Spread the chevre cheese onto the toast and top with the sweet potato and brussels sprouts mixture garnished with pecorino romano cheese. 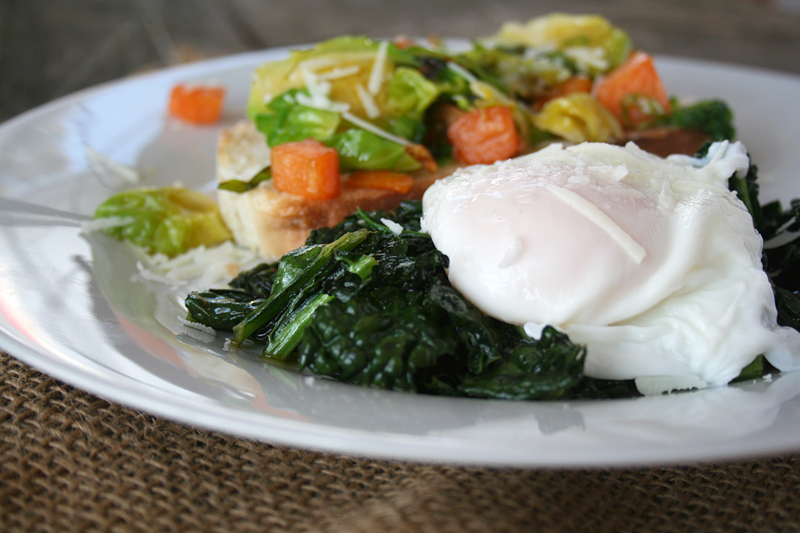 Serve with a side of garlic kale topped with a poached egg. Also, don’t forget … right now, if you sign up for the20 Essential Cooking Techniques, you can register for 50% off! The total for the class comes to $14.99 after discount; however, that discount is only good through October 19th and will expire at 11:59pm MT. So, stop on by Craftsy today and register for 20 Essential Cooking Techniques today! This post was sponsored by Craftsy but all words and opinions are my own. So, have you ever poached an egg before? Tell me, how do you serve poached eggs? Thanks for the tutorial. I’ve never poached an egg, but am looking forward to trying, and may sign up for the classes too. One quick question though, if you are poaching multiple eggs, are they in the water at the same time? Oh I love the sound of this. I’m printing it right now for our weekend breakfast!